This walk: 2014-5-15. Bennett's Cross, North Walla Brook (or River Bovey) head mire, sedge species, Assycombe Hill, ponies, Hurston Ridge double stone row, Kes Tor, hut circles, Hurston Castle, hawthorn tree, rabbit holes, West Vitifer Mine. 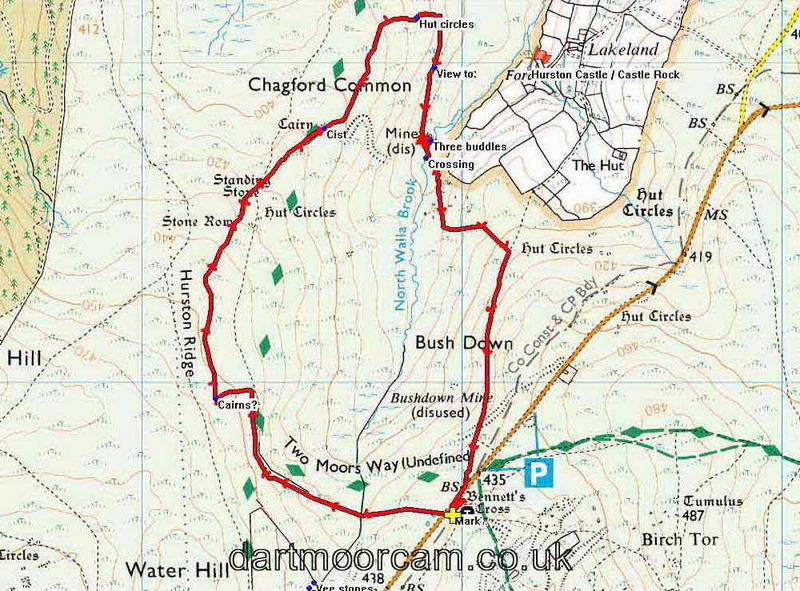 Previous walks in this area: 23rd August 2012 & 15th May 2013. Seen on the rear of the cross as seen in the preceding photo - is this an inscribed letter or merely a flaw in the stone? Head mire of the North Walla Brook (as marked erroneously on the map, according to Hemery, p. 710, citing Crossing as well over the name) or Hurston Water, a local name still in use according to Hemery, which is really the head of the River Bovey. In this area are the disused workings of the Water Hill Mine more towards King's Oven (SX675812, Helen Harris, 1968,The Industrial Archaeology of Dartmoor, David & Charles, p.47) and the Bushdown Mine (SX680818). Hemery uses the name of Boveycombe, for this spot? The Jeremy Butler map for this area (Vol. 2, Map 25) shows this as "River Bovey". The unprofitable Bush Down Mine was in this area, being re-opened in the 1870s as part of teh West Vitifer Mine (visited later on the walk); source: J. Butler (1991), Dartmoor Atlas of Antiquities II, page 33. A sedge (Carex species) - there are 84 species of true sedge in my book and without a specimen under a microscope, your guess is as good as mine. There are many species of other sedge-like grasses. On approaching the objects, on Hurston Ridge, Assycombe Hill came into view ..... we surmised them to be old mine spoil. Light green foliage on trees catching the sun, standing out against the dark conifers of the forestry plantation. Assycombe Hill, part of Fernworthy Forest. Believed to be a meadow pipit. Large rabbit hole with a well-worn track running down to the right. Very large rabbit hole with many rabbit droppings in the area. West Vitifer Mine complex ..... described by source: J. Butler (1991), Dartmoor Atlas of Antiquities II, page 33. The wheel pit area and ramp behind that brought the water-carrying leat. Final view of Bennet's Cross. This walk was reached by parking at the Bennett's Cross car park on the B3212, just past the Warren House Inn when travelling from Postbridge, marked the P symbol and the yellow cross on the map. Distance - 5.37 km / 3.34 miles.